I don’t often, to be honest, feel very hippyish, but on the odd occasions when I do then Givenchy Gentleman suits my mood very well, with its distinct patchouli smell. The original version was released in 1974 to tie in with couturier Hubert de Givenchy’s first ready-to-wear boutique, and it must have seemed bang on trend back then. Created by Paul Lèger (who also had a hand in the big-selling women’s perfume, Anaïs Anaïs), it was quickly hailed as a masterpiece, but has since been turfed out of the perfume pantheon, not least because the original recipe was fiddled about with a few years ago – presumably to save money and comply with tighter industry regulations. 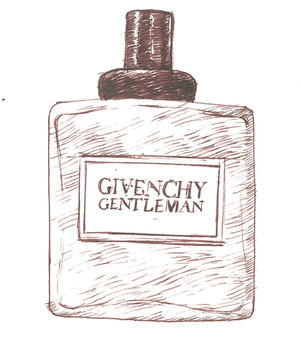 If Givenchy Gentleman contained nothing but patchouli I wouldn’t be writing this review, but Lèger’s long list of ingredients included cinnamon, vetiver and something that approximates to the smell of leather. The last two in particular give the scent its appealing earthy, masculine character and stop it from being too sweet or cloying; it also contains (or contained) a whole host of other fragrance ‘notes’, including lemon and bergamot, tarragon, cedar and sandalwood, which added to Givenchy Gentleman’s complexity and depth. It may not be the perfume that once it was, but I haven’t yet found a more wearable patchouli-based scent for men, though I have to admit that the latest version (has it been reformulated again?) starts well but then develops a slightly sour, unattractive undertone on the skin. It’s been repackaged too, and the latest bottle has such a cheap label that if I didn’t know better I’d be inclined to suspect I’d been sold a dodgy knock-off from a market stall. Sadly it seems that the knock-off effect is entirely Givenchy’s own. I have the same reaction as you to the new version of Givenchy Gentleman which I was prepared to wear despite that. A few months ago I bought a vintage bottle sight unseen, and it’s the best blind buy I’ve ever made. Words are inadequate to describe the depth and richness of the original. It’s just… comforting, and reminds me somehow of the vintage White Linen worn by mom in the 70s. I’ve since picked up another three bottles around the world and consider Gentleman my signature fragrance; a genuine masterpiece worth every penny, and with a dry-down that inevitably turns heads.